At the Fold Dentistry, we take advantage of iTero’s intraoral scanner technology to ensure the best possible outcomes for patients considering Invisalign braces. But don’t let the fancy name put you off. “Intraoral scanner” is simply another term for “hand-held, digital wand” – or what essentially amounts to a small, lightweight camera with the ability to take thousands of images of your teeth in just minutes. The iTero scanning system lets our dental professionals take a thorough look at your oral health, while giving you the opportunity to visualise what your smile will look like after a series of cosmetic aligners. Teeth undergo a significant amount of movement over the course of being corrected with clear braces. 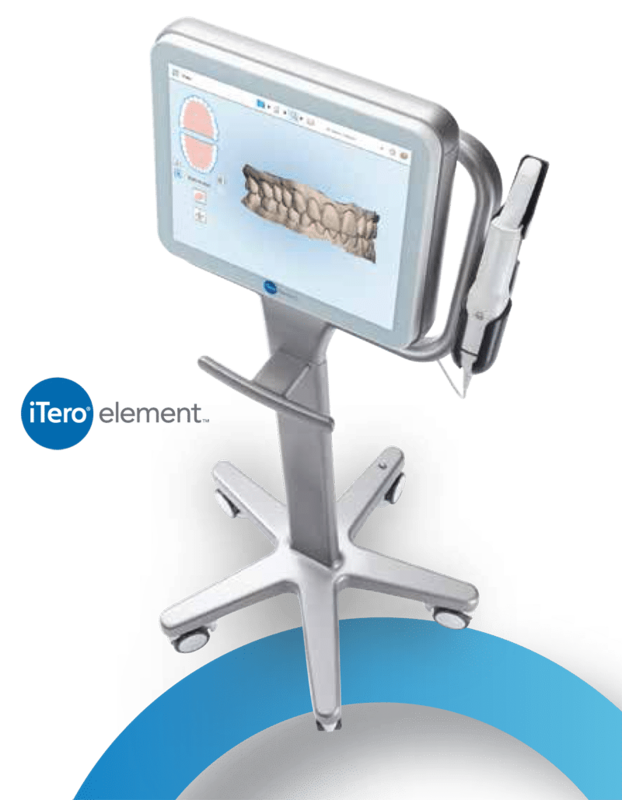 But because it’s been engineered to work directly with the Invisalign system, iTero’s Outcome Simulator lets you watch that realignment happen in moments. We work with multiple iTero scanning machines at The Fold Dentistry – each one designed to create an animated view of exactly how your teeth will move from their current alignment to the position they’ll occupy after treatment with invisible braces. – all of which allows them to track patient progress more effectively. Digitally scanning your teeth also means we can do away with the messy, unpleasant polyvinyl siloxane (PVS) bite impressions that used to be a necessary part of opting for clear braces. Plus, treatment plans submitted directly to orthodontic laboratories using iTero scans are typically initiated three times faster than those based on traditional PVS impressions. iTero’s high-precision digital wand features a built-in interface that makes it as easy to control as a smartphone. With only a simple scanning motion, we’re able to capture everything there is to see in terms of the health and position of your teeth – before, during, and after treatment with invisible braces. The scanning process is amazingly quick. With multiple scans captured and processed every second, a 3D, high-definition, full-colour model of your teeth is revealed almost instantly. Integrated gyro and touch-screen technology lets our cosmetic dentists pinch-zoom, rotate, and manipulate images on-screen – all while explaining scan results to their patients. You see exactly what your dentist sees, making it easier to ask all the right questions about your personalised treatment with Invisalign clear braces. Working with an advanced, precise system like iTero guarantees our patients receive a more accurate cosmetic evaluation. And many of them like the fact that iTero is essentially a “green” technology, with no chemicals being mixed and thrown away, and no carbon footprint attached to delivering scan results. Speed: The iTero intraoral scanner reduces the time it takes to get a clear braces treatment plan started. A full-mouth scan typically takes less than 10 minutes, and results can be sent out immediately. Precision: With iTero, scanned impressions are virtually perfect – something that’s very difficult to achieve with PVS. Digital scans can also be retouched and refined right before your eyes. Convenience: Thanks to iTero’s Invisalign Outcome Simulator, a picture is now worth more than a thousand words. You’ll literally see the result you can expect to achieve with invisible braces in minutes – without having to try and imagine it for yourself, or having to endure sticky, uncomfortable mouthfuls of chemical-based substances.